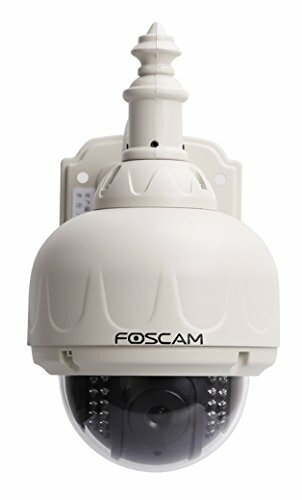 The Foscam FI8905WS Wireless IP Camera features high quality video, waterproof and weather proof outdoor housing, remote internet viewing, motion detection, night-vision as well as a built in network video recording system. This camera has 60 IR LEDs providing night vision visibility up to 98 feet. In addition, it is smartphone compatible (iPhone, Android & Blackberry) as well as viewable over the internet using standard browsers. 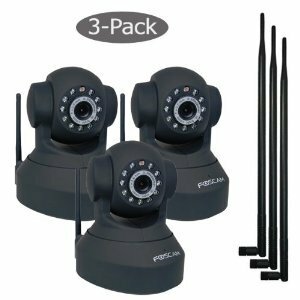 The camera functions well as part of a home or office security system with remote internet monitoring ability. Remote Internet Monitoring, Iphone/Ipad, Android And Blackberry Compatible. Ir-Cut Filter For True Color Video And Images. Two-Way Audio (Built-In Microphone And Speaker). 300 Degree Pan, 120 Degree Tilt. 11 Infrared (Ir) Led Lights For Night Vision Up To 8 Meters. 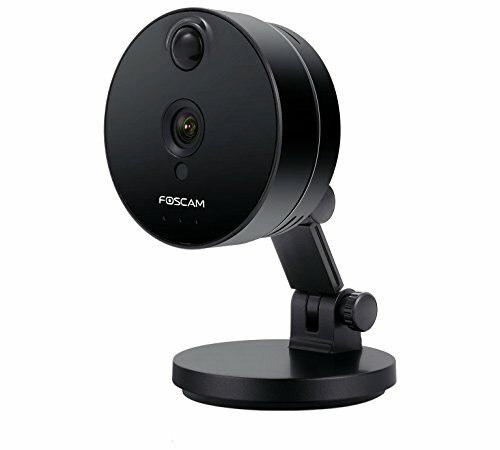 The Foscam FI9816P security camera combines a high-quality HD IP camera with a powerful built-in web server to provide live video anywhere. 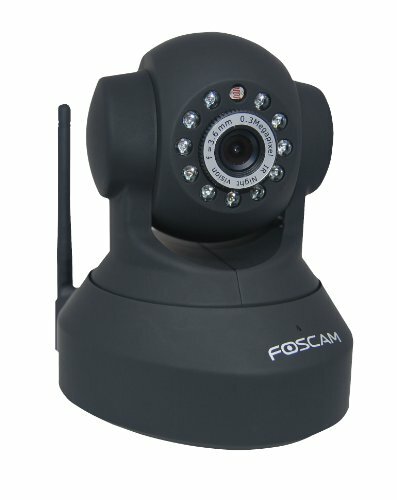 All the Foscam FI9816P wireless security camera requires is an internet connection and a viewing device such as a smartphone or computer. The "Plug and Play" setup process is easy: simply scan the camera’s QR sticker with your smartphone and it syncs with the camera automatically. 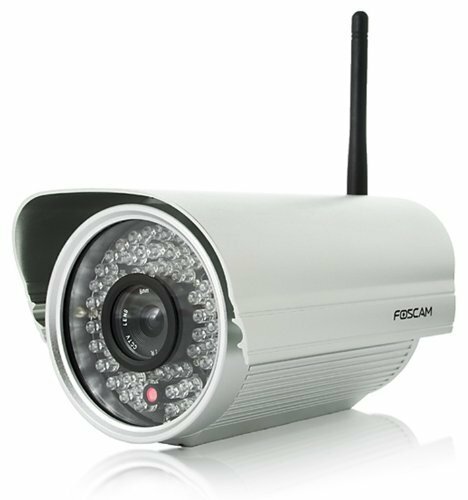 The sleek, attractive casing used by this camera makes it ideal for surveillance applications such as offices, retail stores, stockrooms, lobbies, homes, apartments and more. This camera sports a 70 Degree wide angle lens, 300 Degree Pan and 120 Degree Tilt, and IR-LED night vision. Video can be recorded and saved for free to a micro SD card or hard drive. 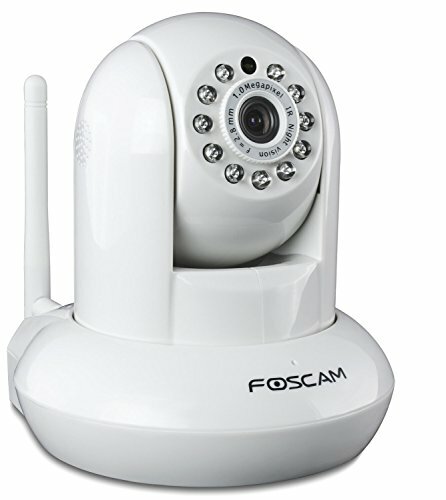 Foscam Cloud service for remote storage is also available (free trial included). 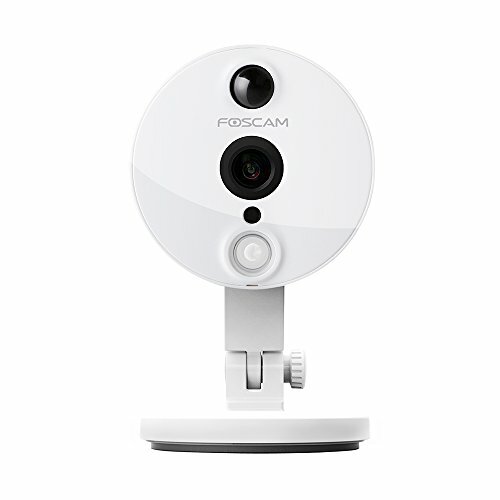 All purchases from Foscam come with our 2 Year US Warranty, making our full-featured, quality engineered FI9816P model one of the best values available for an IP camera. 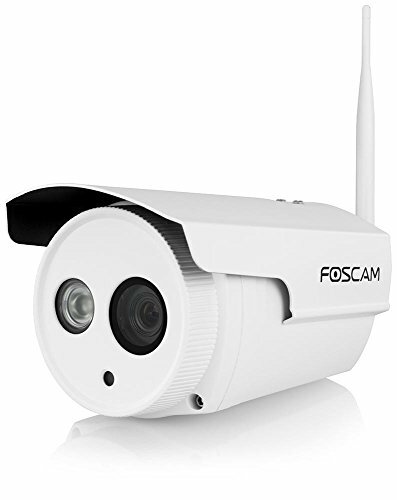 The Foscam FI9821W V2 Megapixel Wireless IP Camera features high definition 1280 x 720p video resolution, h.264 video compression, built-in DVR via SD card (upto 32gb), two-way audio, wifi-N capability, pan/tilt, remote internet viewing, motion detection, night-vision as well as network video recording capability. In addition, it is smartphone compatible (iPhone, Android - app required) as well as viewable over the internet using standard browsers on PC (Firefox, IE & Chrome) or Mac (Safari only). 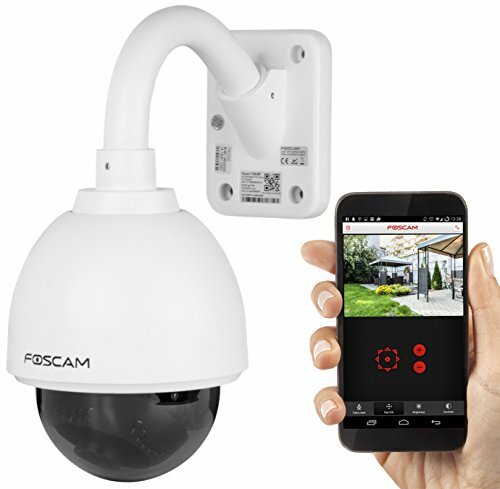 The camera functions well as a smartphone baby, pet or elderly parent monitor or as part of a complete home/office security system with remote internet monitoring ability. The FI9821W V2 improves on the FI8910W by adopting high performance media and video processors capable of H.264 video compression which allows for ultra-smooth high definition video transmission, increased FPS and minimal bandwidth consumption. In addition, due to the small file sizes produced by H.264 video compression it has the ability to save tremendous disk space when doing video recording. FI8919W Features: -22 IR lights for night vision. -4mm lens for 55° wide viewing angle. -Motion detection. -Built-in network video recording system. -Compatible for smartphones. -Remote viewing over the internet using standard browsers. Product Type: -Surveillance camera. Color: -White. Number of Channels: -1. Camera Type: -Pan/Tilt. Outdoor Use: -Yes. Connection Type: -Wireless. Motion Sensor: -Yes. Network Capable: -Yes. Night Vision: -Yes. Audio Recording: -Yes. Display Type: -Mac compatible/PC compatible/Smartphone compatible. Dimensions: Overall Height - Top to Bottom: -6.6". Overall Width - Side to Side: -10.7". Overall Depth - Front to Back: -12.6". Overall Product Weight: -4.25 lbs. 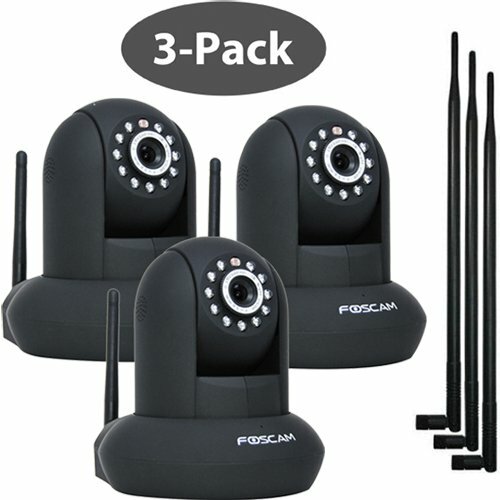 3 Black of The Foscam FI8910W features high quality video and audio, pan/tilt, remote internet viewing, motion detection, night-vision, embedded IR-Cut filter as well as a built in network video recording system. In addition, it is smartphone compatible (iPhone, Android & Blackberry) as well as viewable over the internet using standard web-browsers. The camera functions well as an iPhone baby monitor or as part of a home or office security system with remote internet monitoring ability. 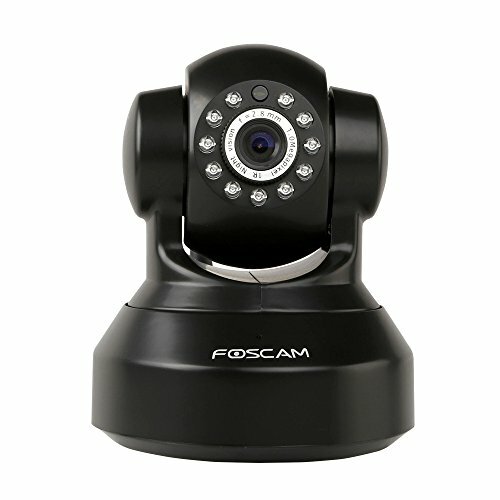 Building on the success of the Foscam FI8918W, the FI8910W is the latest camera from Foscam Digital Technologies LLC. The FI8910W distinguishes itself with an embedded IR-Cut filter providing enhanced picture and color quality. The IR-Cut filter automatically adjusts the lighting exposure via mechanical filter to provide true and accurately colored images that are not washed out. In addition, the FI8910W has an upgraded and higher quality external housing as well as an included 2 year extended warranty. 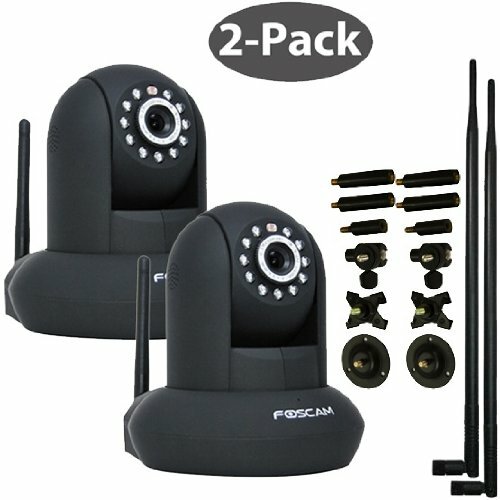 Features: Remote internet monitoring from anywhere in the world over LAN or internet Supports standard browsers; iPhone/iPad, Android & Blackberry compatible IR-Cut filter for true color video and images Two-way audio 300 degree pan, 120 degree tilt Auto IR-LED illumination lights for night vision up to 8 meters IR lights can be turned off manually from the software Audio quality is improved, there will be no noise when speaking into the camera. WPA2, WPA & WEP Internal mic as well as jack for external mic Simple to setup with a friendly graphical interface 640 x 480 Pixels (300k Pixels) Infrared Motion Detection (with email notification and image upload via FTP) Wifi IEEE 802.11b/g, Wired connection also included DDNS Multi-level user management.what's in the box: Foscam Wireless IP Camera, Wifi Antenna, User Manual, Installation CD, Mounting Bracket, Network Cable and DC Power Supply 5v. Product Description Replacing the Foscam FI8908W, the FI8918W is this latest camera from Foscam. 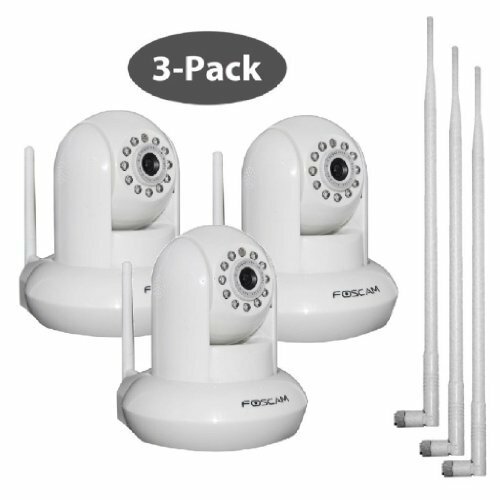 The FI8918W is a wireless or wired, pan/tilt IP camera solution for indoor use. 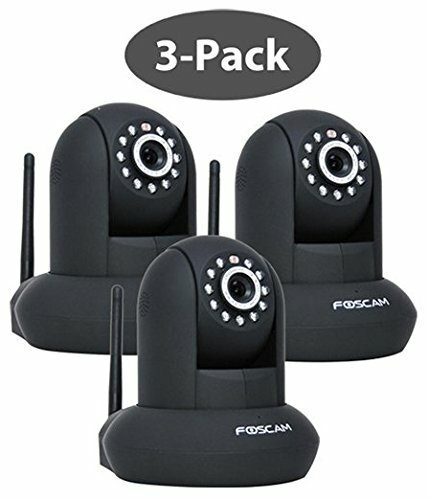 It combines a high quality digital video camera, remote pan/tilt ability with network connectivity and a powerful web server to bring clear video to your desktop or smartphone from anywhere on your local network or over the Internet. The high quality video image is transmitted with 30fps speed on the LAN/WAN by using MJPEG hardware compression technology. The image resultion is 640 x 480 (300k Pixels). 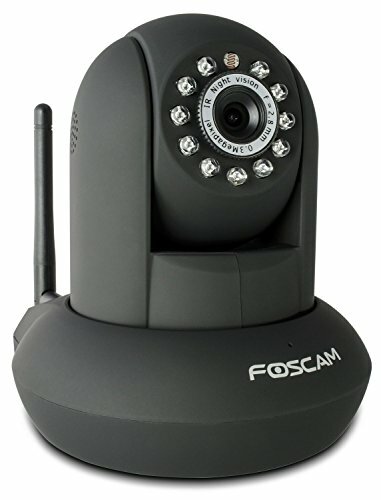 The Foscam FI8918W camera is based on the TCP/IP standard. The control, management and maintenance of the camera is done simply by using your browser to remotely configure and upgrade the firmware. 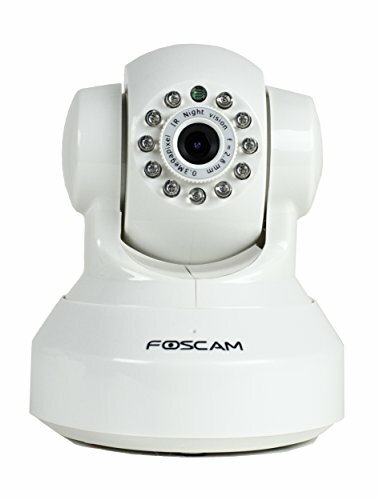 The Foscam FI8918W IP camera can reach up to 8 meters of visibility in absolute darkness with 11 infrared LED's.